Introducing The First Wall Mounting Music Center. Rock-Ola Mystic Music Center 115V. Stylish and space saving, the Mystic is a compact alternative to the full-sized music center. 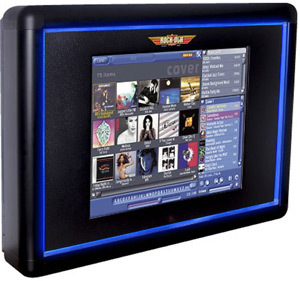 They Mystic offers the same revolutionary touchscreen control as the nostalgic music center models in a spiffy, wall mounting metal cabinet. Illuminated with a simple and elegant halo of blue light, the Mystic’s versatile design compliments many of today’s modern interiors. The generous 19 inch auto magic technology to compliment today’s music media. The Mystic has a huge 1 Terabyte harddrive with storage capacity of 13,000 CD’s. It can be hung with a standard TV mount. Optional feet allow the mystic to reside on a table or counter top. The amp and speakers are built into the unit and additional speakers may be connected for 2-zone control. At a mere 7 inches deep, this compact music center fits anywhere, from gameroom to living room, wherever you want to play music.